There is no record of any Commission on Election resolution which changes the minimum threshold to 25 percent, said the PET. It is not also in the Comelec Resolution 9164 which amends Resolution 8804 contrary to the black media propaganda or lies of Vice President Leni Robredo’s camp. The rule states that when an amendment is silent on a provision, the earlier provision stands. [VIDEO]: Hiling ni Robredo na 25% threshold sa manual recount, ibinasura. The PET corrects Robredo’s disclosure saying that the Random Manual Audit Guidelines and Report is not sufficient proof of lowering the threshold for manual recounts. The random manual audit is definitely not legally the same as a manual recount. The 25 percent mark was just in the minutes of an en banc meeting of the Comelec on September 6, 2016. This is four months after the election. Just as when the electoral protest of Bongbong Marcos already commences. 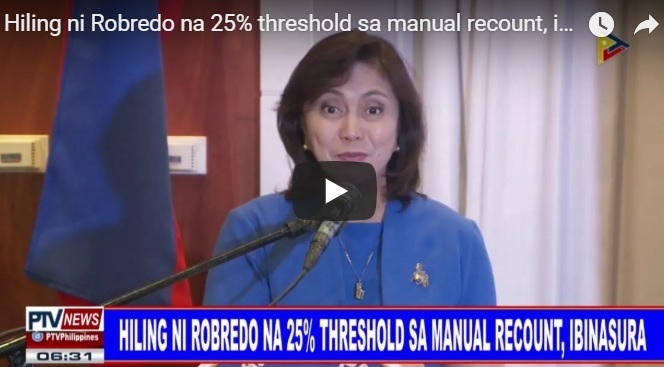 Robredo’s legal representatives and supporters insist that the fiction of a 25 percent minimum threshold is appropriate despite its groundless stand. It is obvious that Robredo can have more sleepless nights. Now that the PET confirms the law, their camp immediately becomes the great liar in today’s politics. Despite the knowledge that the Vice President’s claim is unlawful, some legal entities are biased. Those who stage protests in her favor are a shame to the country’s justice system. They are ready to lie to the public and misled them to justify their false beliefs. Robredo benefit from the secret alteration. 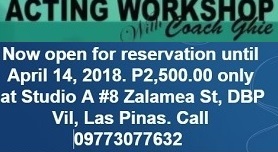 This is why when the PET revisors legally follow the threshold of 50 percent, her lead over Bongbong Marcos dwindles. It is enough for her to sound the alarm and appeal her case. However, as per the latest revelation from Gov. Imee Marcos, Robredo’s 263,473 votes lead over Bongbong Marcos is now down to 200,000. It’s likely that the Philippines will have a new VP soon. The revisors at the Supreme Court said that they saw “many votes of President Rodrigo Duterte that did not go to him. However, their attention is on the result of the manual recount and revision of ballots in the vice presidential election protest filed by Bongbong Marcos against Vice President Leni Robredo. The President knew this right after the May 2016 election when Pastor Boy Saycon of the Binay Camp first reports to him through the phone the anomalies done by the LP. Saycon’s pronouncement later matches the testimonies of witnesses in the Senate. This is why Du30 whispers to Marcos that he is cheated during their first meeting in Davao. 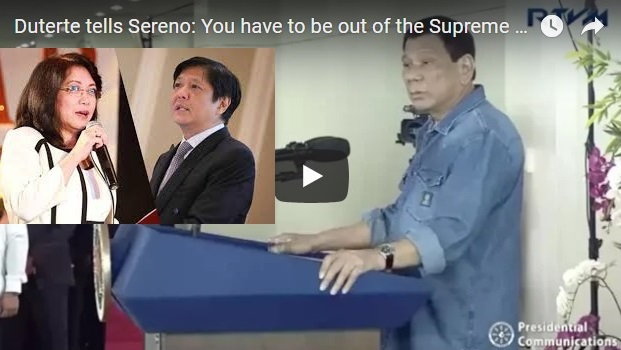 [VIDEO]: Duterte tells Sereno: You have to be out of the Supreme Court. The President said it many times to Sereno that he always follow the rule of law. Despite that, the ousted Chief Justice never stops discrediting him. That drives the Filipino leader to deal with her head on. At the present time, revisors of the Presidential Electoral Tribunal of the Supreme Court said that there were votes cast for President Duterte that were not counted in his favor. They randomly check the votes cast for the presidency “to check if there were also discrepancies in the presidential election after discovering discrepancies in the results for the vice presidential election.” President Duterte won the 2016 election with more than 6.6 million votes than those garnered by his closest rival, Mar Roxas. The manual recount and revision of votes in the provinces of Camarines Sur, Iloilo, and Negros Oriental is now in its seventh week. The results in the recount and revision of ballots in the three provinces would determine if the PET, composed of all Supreme Court justices, would still pursue the protest in 24 more provinces and cities covered by Marcos’ case. Lawyer Vic Rodriguez of the Marcos Camp said that the reduction of votes for President Duterte was not a surprise. “We are not surprised by such report because it just confirms what we have been saying all along – that the cheating was widespread that it also affected President Duterte but his lead was insurmountable that all attempts failed,” Rodriguez said. The removal of Chief Justice Maria Lourdes Sereno from the Supreme Court signals an upcoming big change in the government. Many Filipinos suspect and hope that the declaration of the VP race real winner is next to come. Marcos can be the new Vice President soon. Things may be quiet now because of the gag order but one thing is certain; the Philippines will soon have their elected leaders and much more. Bongbong Marcos clearly pinpoints Supreme Court Associate Justice Benjamin Caguioa, the magistrate in charge of his election protest before the Presidential Electoral Tribunal (PET), for obvious biases against him. However, Vice President Leni Robredo discredits the whole institution by urging it to give her a fair fight on air. She wants the 25% COMELEC’s threshold guide for the recount instead of the PET’s 5o% ruling. She banks on her motion for reconsideration on this matter that Marcos detests since he knows that most of her votes are from the PCOS machine. Isn’t she the one who said that her opponent has supporters who are not real people? The PET made its decision after various anomalies are found during the recount of Camarines Sur’s ballots, her bailiwick. The Supreme Court to Give Robredo a Fair Fight? Robredo recently asks the Tribunal to reverse its earlier ruling that rejects her appeal to apply the 25 percent threshold for the ongoing vote recount. With her are legal counsels Romulo Macalintal and Bernadette Sardillo. They personally troop to the Supreme Court, that sits as the PET. This is to file the motion for reconsideration. The VP addresses her supporters outside the SC compound where she urges the PET to give her a fair fight. Lawyer Vic Rodriguez, spokesperson of Marcos, in a statement, said that the vice president should stop “casting aspersions meant to debase [the Presidential Electoral Tribunal’s] integrity.” “Robredo cheated her way to the vice presidency and in this [ongoing] manual recount and judicial revision, she is attempting to cheat the Filipino people again by trying to change the rules in the middle of the game,” the lawyer added. Barangay Laganac, Municipality of Balatan, Camarines Sur where Robredo got 358 votes are in Robredo’s plea. Upon the application of the 50 percent threshold, the physical recount on the ballot yielded 346 votes for the vice president. Votes for Marcos did not change in the tally. “[I]n simple terms, the votes for the VP decreases by 12 votes while the votes for Marcos remains the same,” the motion reads. Whose Voters are NOT Real People? Criticize Bongbong Marcos and your friend would either fight with you or unfriend you via Facebook. Whereas, Robredo’s online presence is seldom felt. Aside from the many Filipinos who are in shame every time she speaks in front of an international audience, most online defenders of the unpopular VP seem to be incognito or trolls as she describes them. Is Robredo Accusing the Supreme Court of NOT Giving her a Fair Fight? The denial of questionable Vice President Leni Robredo’s urgent motion to allow the COMELE’s 25 thresholds of the digital election horrifies her. This is for the manual recount that is currently ongoing. This would immediately mean that the lighter shades or perhaps fakely done ballots are out. That’s why her camp admits that the 50% standard of the PET can quickly lower the VP’s votes. It is, however, beneficial to Bongbong Marcos who has the most legitimate voters. The Supreme Court that sits as the Presidential Electoral Tribunal (PET) denies Robredo’s motion. She asks that it follows the shading threshold set by the Commission on Elections to consider votes as valid. 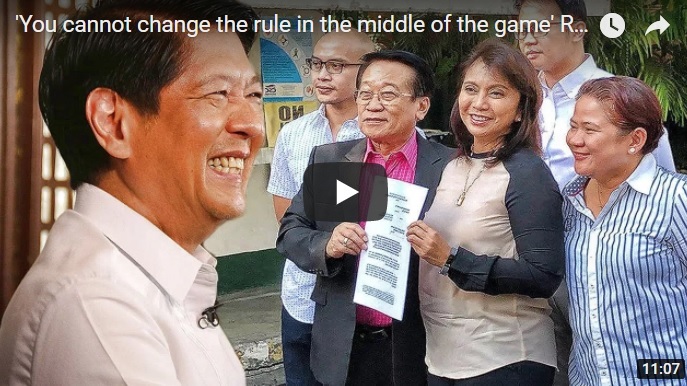 Robredo’s legal team pleads the PET to apply the 25 percent threshold for ballot shading as it embarks on its manual recount of vice presidential votes from over 5,000 ballot boxes from three provinces as part of former Senator Bongbong” Marcos challenge to her 2016 poll victory. However, the VP is not successful. It seems that the Supreme Court needs to balance things out as the people are already furious about its being biased to the Vice President. Insensitive Information or Public Interest? The PET also asks both Robredo and Marcos’ camps to explain why they should not be cited in indirect contempt for disclosing “sensitive” information as regards the recount process. It considers that they have earlier been ordered to refrain from making comments on the poll protest pending its resolution. Lawyers insist particularly, Atty. Glenn Chong that he is not under the gag order. Therefore, he continues to disclose all information that pertains to the recount as they happen. His social media posts are on site in online news platforms and bloggers elaborate on them. Therefore, the PET cannot blame Marcos and Robredo for such leaks. Instead, they should learn to adopt the policy of transparency. This is to avoid accusations that they are hiding things from the public.